Scoped out on Folksy by beauty blogger Jayne, these confectionery inspired cushions are created by Dundee-based crafter Nikki. A Jammie Dodger cushion is the best kind of cushion! Charlotte has inspired us to to try our hand at freehand nail art after nailing (ha) these Breton stripes. The little heart is the icing on the cake. 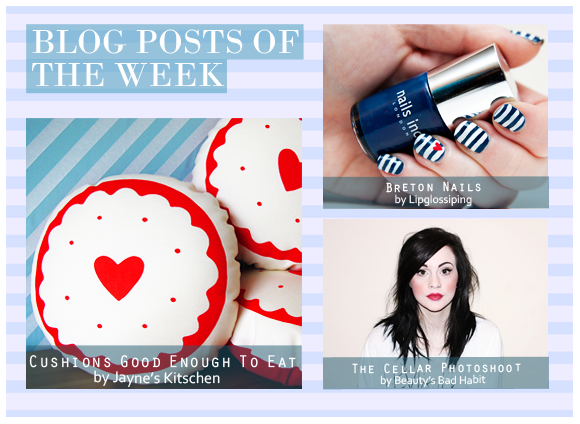 I love the contrasting pictures in this blog post. From the bright, over exposed portrait shot to the dark and dingy feel of the cellar shots, Lily captures two very different kinds of beauty. This entry was posted on Friday, February 24th, 2012 at 8:00 am and is filed under Blog Posts of the Week. You can follow any responses to this entry through the RSS 2.0 feed. You can skip to the end and leave a response. Pinging is currently not allowed.